The versatile Dominican singer Maridalia Hernández will be at the at Hard Rock Café, Blue Mall, Santo Domingo on January 30, 2015 at 10PM. 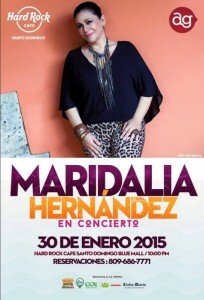 Maridalia Hernández, born in San Francisco De Macoris, is a well known singer, pianist, cellist and music teacher. She has been part of 4:40, the Juan Luis Guerra back-up singers and has also appeared with jazz pianist Michel Camilo. Events concert, hard rock cafe, maridalia hernandez. permalink.